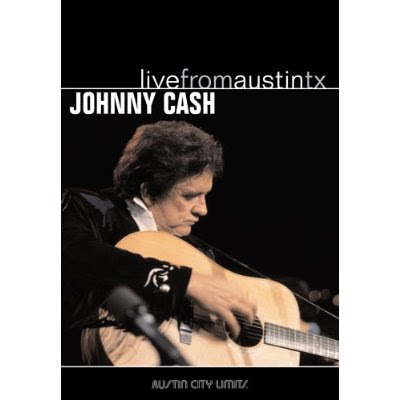 Twenty three years ago today, on January 3, 1987, Johnny Cash performed on "Austin City Limits," the DVD of which is available here. I've written about Johnny Cash in Austin before, specifically his December 1994 performance at the Frank Erwin Center, but that was after Cash had linked up with producer Rick Rubin and began the great and final resurgence of his career. Cash was a revolutionary in many ways, but most of what we as listeners know of his career occurred long before 1987: the hits, the drama, the marriage to June Carter. (There's a reason why the biopic Walk the Line stopped its narrative long before 1987). The ACL performance prompts the question: What would have become of Cash had Rubin not produced his next few albums? Would he have done as the DVD's set list suggests and performed a series of greatest hits victory laps until he was ready to retire? Although Cash was certainly a musical treasure prior to 1994, it could not be said that in the late 1980s his most recent output was well known or recognized as among his best. (In the late 1980s, Cash was signed to Mercury Records.). But when Cash and Rubin collaborated in 1994 to release American Recordings (and several more similar albums over the following years), he reinvented himself in a way that few 62 year old musicians receive an opportunity to do. Listening to the 1987 set list, it's difficult to imagine that in less than a decade he would become a darling of the indie community and that hipsters a third his age would be wearing his t-shirts and buying his most recent albums. Ah, the fates. The culmination of Cash's long time collaboration with Rubin was, of course, the cover of "Hurt" by Nine Inch Nails. Listeners already knew the trial and travails of Cash, which were public knowledge long before Joaquin Phoenix brought them to the screen. This working knowledge of Cash's life serves as its own preface to his rendition of "Hurt," and, accordingly, it touches the listener in a far more powerful fashion than the the original version of the song written by Trent Reznor. Although Reznor's lyrics remain powerful, it is when his words are coupled with Cash's vocals that their significance is truly felt. Cash's voice strains, and almost fails, as he sings the song, and the result is astonishing: we believe him when he sings those words. He is "Hurt." 3. "Sunday Mornin' Comin' Down"
4. "I Walk the Line"
8. "I'll Go Somewhere and Sing My Songs Again"
12. "(Ghost) Riders in the Sky"
16. "Wonderful Time Up There"